On 8 and 9 November 2016 the Learning Activity What Could They Know? 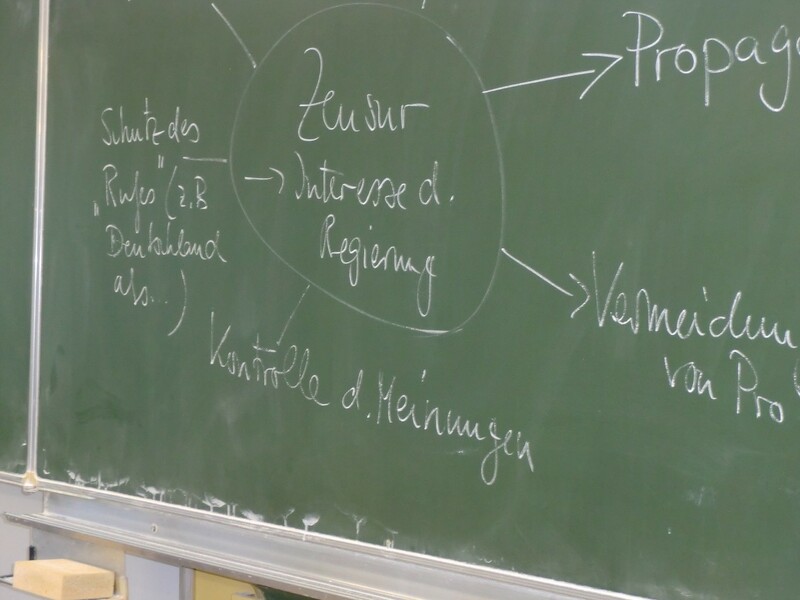 developed within the EUROCLIO project Silencing Citizens through Censorship was successfully piloted at the Max Beckmann School, a regular gymnasium in Frankfurt, Germany. The class working with the material consisted of 25 students (15 boys and 10 girls) ranging between 16-18 years of age and with some having migratory background from different countries (Turkey, Italy, Kosovo, Serbia, Poland). The material was tested in a three hours lessons by Michael Fischer, the history teacher of the class, and dealt with the November Pogroms 1938 and what the people could have known about the incident. The chosen date for the piloting was also an act of remembrance as the ‘Crystal Night’ (Kristallnacht) took place exactly 78 years ago. Different teaching pedagogies were employed during the lesson such as working in pairs, working in small groups and discussion in the classroom. Feedback was again primarily positive. The students found the topic very engaging and thought-provoking and responded that the activity gave them a general insight into the concept of censorship. Through historical examples of censorship the students were encouraged to critically reflect on on-going discussions throughout Europe on freedom of speech and its limits. They particularly enjoyed working with original documents such as analysing the regulations of the German News Agency on the assassination of the Legation Secretary von Rath in Paris and the advices for the reports on the „Kristallnacht“. They also found the sources, a report by the Manchester Guardian and a Jewish witness interesting and discussed the impact of the advices and possibilities of alternative information sources in a totalitarian regime. The piloting in Frankfurt confirmed that the concept of the learning activity itself is working. However, the worksheet, which was used as a starting point for the unit and shows some regulations by the German News Agency in 1937 needs more contextualisation.